The Apple Watch was first announced back in September, as the company's first wearable device. The Apple Watch is a late entrant into the wearable market which is currently dominated by Android Wear devices from Samsung, LG, Motorola and others. Today Apple was ready to unveil more details regarding the Apple Watch including its final features, pricing and availability. The Apple Watch is a beautifully crafted wearable, with distinct functionality and innovative hardware. In the past, the company "reinvented" the portable media player with the iPod Touch, and did it again with the iPhone. Now they are ready to do it yet again for smartwatches, despite coming in late. The Apple Watch will be available in three distinct types and two different sizes. Each of these will have various watch bands to select from and watch faces to customize with, giving the user a wide range of customization to suit to style and fashion. Stainless steel or space black stainless steel cases. Sapphire crystal. A range of stylish bands Anodized aluminum cases in solver or space gray. Strengthened Ion-X glass. Colorful, durable bands 18-karat gold cases in yellow or rose. Sapphire crystal. Exquisitely crafted bands and closures. All of these models come in two sizes: a larger and slightly pricier 42mm (male oriented one), and a smaller, 38mm (female oriented version). 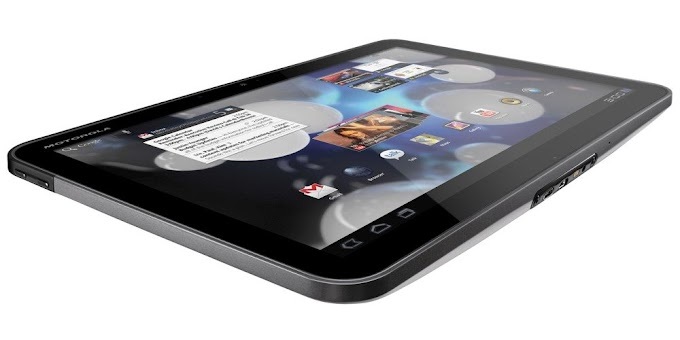 The 42mm version has a 1.7 inch display with a 390 x 312 pixel resolution and a 293ppi pixel density. Meanwhile the 38 mm version has a 1.5 inch display with a 340 x 272 pixel resolution and a 290 ppi pixel density. While the Apple watch display doesn't look as flattering up close as the iPhone 4 display, it's certainly one of the most vivid, lively displays we've seen on a smartwatch. Animations seem to be running at a full 60 frames per second, which makes them seem very fluid. Hopefully, the display is also bright enough to be used in sunlight. Around the flexible display, tiny electrodes are positioned that distinguish between a light tap and deep press, triggering specific commands. This is the so-called Force Touch tech that's poised to make an appearance in the next iPhone. Pressing firmly on the Apple Watch's screen brings up contextual controls in apps like Messages, Music, and Calendar. Beneath the display, a linear actuator produces haptic feedback, tapping you on the wrist whenever you receive an alert, a notification, or press down on the display. It's not the good old vibration motor, which uses a rotating mass - it's a linear resonant actuator, or a pizeoelectric actuator. 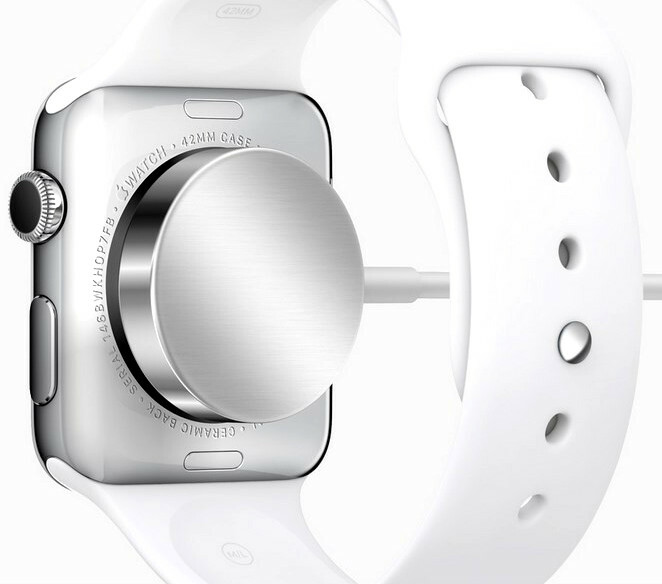 The Apple Watch is powered by an Apple-designed, Samsung-made processor by the name of Apple S1. It is said to be nearly as powerful as the one in the iPhone 4s, and it's also an achievement in itself. The 28nm application processor, memory, storage, and support processors for wireless connectivity, sensors, and I/O are entirely contained in a single module, whose contents are encapsulated in resin to protect them from outside forces. Not much else is known about the CPU, but component suppliers have previously informed analysts that the CPU is paired with 512MB RAM and 4GB of storage. 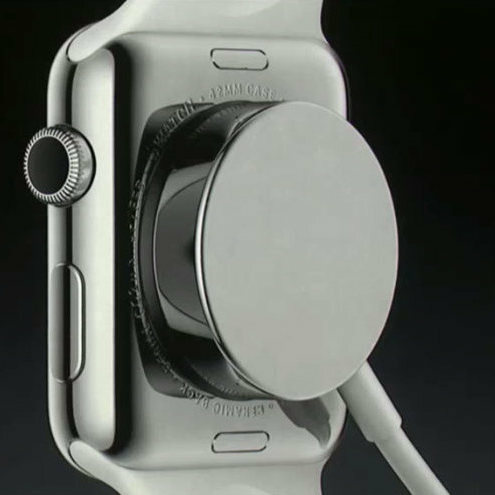 The Apple Watch also packs its fair share of sensors. You have an optical heart rate sensor, which uses both visible and infrared light to determine your pulse. It also includes photosensors that work together with the light and infrared ones. The device most likely has a single microphone, and it also features a pressure sensor, and an accelerometer. The Apple Watch most likely uses a Broadcomm BCM4334 networking chip, which has seen use in devices such as the Galaxy S3 and the iPhone 5. It supports Wi-Fi 8-2.11 a/b/g/n, Bluetooth 4.0, FM radio, and there's also NFC for Apple Pay. The Apple Watch is IPX7 certified. 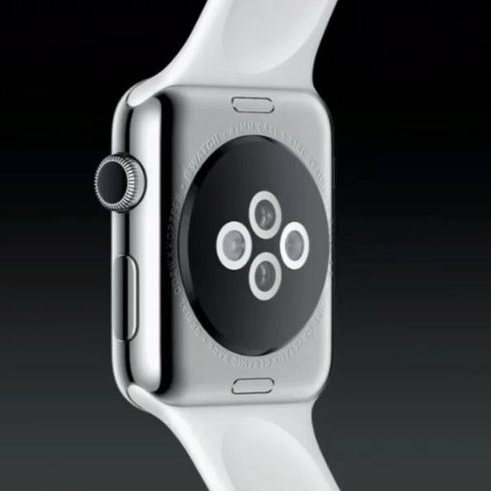 The X indicates that the watch does not carry protection from dust, while the 7 digit indicates that the Watch is certified to withstand immersion in up to 3 feet deep water for as long as 30 minutes. However, Apple suggests that the Watch is not waterproof, and claims that while you to use it during exercise, rain, and while washing your hands, it is NOT recommend actually submerging it under water. We don't know what battery cell powers the Apple Watch, but the company boasts that their wearable is capable of about 18 hours of battery life. Of course, this is mixed usage and standby scenario, which would likely translate in the fact that you will be able to plough through the working day with moderate Apple Watch tinkering, then get home and stick its magnetic charger on the back before the battery gives up the ghost completely. Now lets move on to each Apple Watch type, to see how the models you can select can differ from one another. 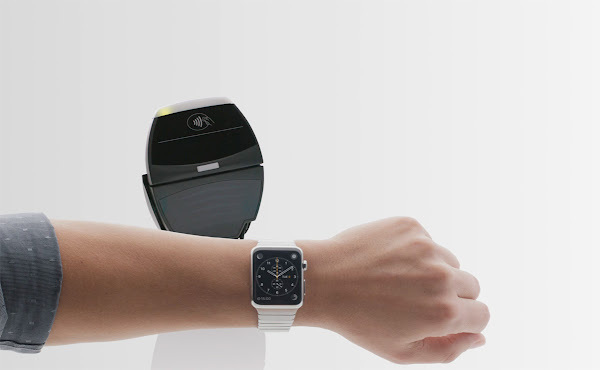 The regular Apple Watch is likely the model that most users would consider purchasing. This model will be available in 38mm and 42mm sizes and features highly polished stainless steel and space black stainless steel cases. The make the material even stronger, Apple has made it up to 80% harder than regular stainless steel, through a specialized cold-forging process. They also added a carbon layer to make the space black stainless steel case and matching steel band. You also get a choice of three different leather bands, a link bracelet, a Milanese loop, and a band made from high-performance fluoroelastomer. The display is protected by sapphire crystal that's cut using diamond-encrusted wire and polished with diamond-covered pellets. The wristband is made of the same steel alloy. There are a total of twenty different models to choose from, based on the watch size and different band combinations. You can learn more about the Apple Watch here. Next we have the Apple Sport, which has cases made of anodized aluminum in silver and space gray. Its cases are made using 7000 series aluminum, which has been 60% stronger, at one-third the density of stainless steel. Each aluminum case is machined, polished, and blasted with microscopic zirconia beads for a consistent satin texture. Finally, anodizing creates a hard, clear outer layer for protection against scratches and corrosion. Again you will have a choice between the 38mm and the 42mm Apple Watch to select from. The Apple Watch Sport's watchface is covered in Ion-X glass. 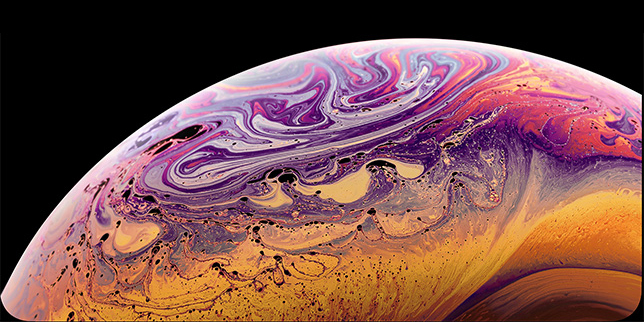 This type of glass is used in space shuttles and high-speed trains - it's five times stronger than regular glass. The construction is complete with fluoroelastomer - it's what the wristband is made of. The material is fire and water resistant, flexible and strong. It has a soft feel and drapes smoothly across your wrist. You have ten different Apple Watch Sport styles to pick from based on watch size and different band combinations. You can learn more about the Apple Watch Sport here. The Apple Watch Edition will be available in eight unique versions, each crafted from 18-karat gold which has been developed to be twice as hard as standard gold, and it's coming in authentic yellow and rose gold colors. The display is protected by polished sapphire crystal for that added level for protection for your wearable. And for the wristbands, Apple shopped leather hides from "three of the world's best-known artisan tanneries", added magnets to the quilted Leather Loop (for an infinitely adjustable fit), and an inner layer of stretch-resistant polymer (stronger than Kevlar) to the Modern Buckle. 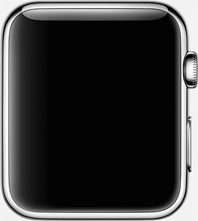 The Apple Watch Edition is also available in 38mm and 42mm sizes (height). It is also water and dust-resistant. You can learn more about the Apple Watch Edition here. The Apple Watch is almost here, and it has a lot worth getting excited about. While this wearable is not meant to replace your smartphone in anyway, it acts as the perfect companion. Each Apple Watch comes with a variety of faces to choose from. You have traditional designs, along with some modern designs to suite your style. Most faces are extensively customizable - you can change colors, choose design elements, and add functionality. The Apple Watch is designed for brief interactions – ones lasting only a few seconds – hence the simple, gesture-controlled user interface. Stock tickers, news, current Twitter trends, and updates on sports events are only at a swipe's distance, fed by the respective apps on your iPhone. Using Apple Pay, one can make payments in participating retail stores, and with the help of Passbook, they can cross security at airports as the needed barcode is shown right on the watch's display. These various screens that appear on the Apple Watch are called Glances, and there can be many of them. Third-party apps like Uber, Shazam, WeChat, Twitter, Facebook, Instagram and hundreds more will be available on the Apple Watch from the get-go. But touch is not the only method of interacting with the Apple Watch. Apple's digital assistant Siri, has also found a home within Apple Watch, allowing you to send commands using your voice. She is triggered with a simple press of the Watch's crown. On top of that Apple has also made it possible to make and receive calls using the mic and speaker on your Apple Watch. In fact, you don't need to be in range of your iPhone's Bluetooth radio as the two can communicate over Wi-Fi as well. When the time isn't right for a one-on-one voice conversation, you may speak out a text message or send a voice message instead. You can even send a sticker, or draw a pretty picture on the Watch's screen and send it to the Watch of a special someone. At the same time, the Apple Watch doubles as a fitness device, monitoring your activity and measuring your pulse as you exercise. And if it detects that you have been sitting at your desk for longer than you should, it will remind you to take a 1-minute walk to get those juices inside you running again. To turn off the Apple Watch, you just cover its screen with your palm, and to charge it, you place it in its magnetic charging cradle. Are you planning on getting an Apple Watch at launch ?